The iconic “Pink Ribbons” have become an enduring symbol of the fight against breast cancer. Now, award-winning designer Donna Lee has incorporated this powerful symbol of hope in a stunning ring highlighted with a “ribbon” of square-cut pink Swarovski® crystals. 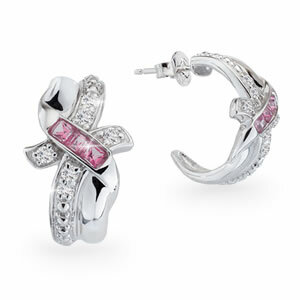 This design also features sparkling genuine White Topaz accents set in solid Sterling Silver… an exquisite tribute to the courage of women whose lives have been touched by breast cancer.